Otto Greule Jr/Getty ImagesThe Marina district disaster zone after the 7.1 magnitude Loma Prieta earthquake on October 17, 1989. That is the first questions asked in “Hazard a Guess,” an ongoing series by the US Geological Survey (USGS). Dubbed the “riskiest science quiz you will ever take,” the quiz series aims to raise awareness of natural hazards, including hurricanes, wildfires, floods, earthquakes, volcanoes, and much more. 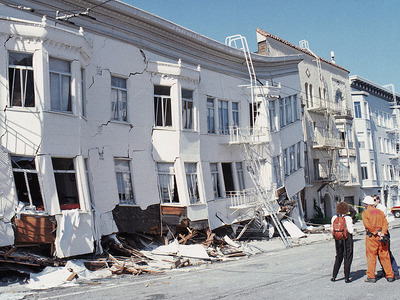 The data helps researchers better understand the scale of earthquake hazards and ultimately strengthen the country’s ability to protect Americans against future disasters, said Kishor Jaiswal, lead author and USGS research structural engineer in a statement. But in the meantime, to help all of us understand what possible natural dangers we could face, “Hazard a Guess” will publish a new question every three weeks or so. Next up is: In what year did the United States experience the most acres burned from wildfires? Check back with the USGS soon to find out the answer.